The only major challenger to the 10mmC is the 4mmC. The 4mmC is the latest incarnation of a persistently reoccurring meme in ammunition design : that velocity can substitute for calibre and mass. The 4mmC is a light, very small calibre high-velocity round. Advocates of the round champion its low firing impulse, flat trajectory and close range penetration. A large quantity of ammunition weighs very little and it is easy to learn to shoot accurately. Critics point out individual rounds do very little damage and that you need to fire more rounds to disable a target. A good analogy here is to compare a knitting needle to a hammer. 4mmCs can wound and kill but lack the stopping power of larger rounds. Nevertheless, many agencies are more swayed by aggressive marketing and product placement than by logic and experimentation. Effectively the 4mmC would be considered a varmint, plinker and target round in other ages. It can be effective if it penetrates a cybershell since the tiny rounds tend to ricochet around the airspaces in the machine. Some police forces consider the smaller wounds from the 4mmC to be a more minimal lethal force option. Conversely, the 4mm bullet creates very narrow wound channels that are difficult to clean, increasing the chance of complications due to infection. Silenced 4mm pistols are popular with assassins since the weapons are compact and lightweight and with the right loading, very quiet. A 4mm fired into the back of a skull at close range does the job quietly and neatly. Seal the entry wound with skin spray and the scene of crime will be bloodless. 4mmC single-shot weapons can be concealed in a variety of apparently everyday objects. Why be caught carrying a pistol when you can carry a pocket full of pens? The 4mmC relies on its high velocity for target effect. Subsonic loads for 4mm are therefore not much more effective than a .22LR Subsonic load. Subsonic 4mm are 1d+1 from a PDW or long barrelled weapon, 1d-1 from a pistol. Range is x 0.6. Plastic/Non-metallic Subsonic 4mm ammo is 1d from a PDW and 1d-2 from a pistol, range x 0.3. Weapons will also need a sound suppressor. 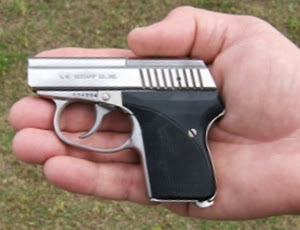 The 4mm round is also used in extremely small handguns, the TS-era equivalent of .25 ACP “mouse guns”. These have 2” barrels and are around 4” in length. They may be completely concealed in the palm (Holdout -1). People with large hands (e.g. most overweight or exceptionally tall characters) would have trouble manipulating them (-1 to Guns skill). Standard rounds fired from such short barrels are already subsonic. Most of the propellant is wasted so the given damage and range for standard or subsonic ammo is the same. For any plastic ammunition reduce damage by an addition -2 and range by x 0.3. Iron sights for such guns may be rudimentary or absent. Some TS-era mouse guns are fitted with compact visible wavelength targeting lasers (HT 4e p.156) giving +1 to hit if the spot is visible. The size, weight and low recoil of mouse guns allows them to be mounted on very compact cybershells. The low recoil impulse of the 4mm round permits a fully automatic selective fire weapon the size and weight of a large pistol. The 4mm MP can fire semi-automatic, fully automatic or three round bursts and can be fitted with a shoulder stock. A weapon favoured by some bodyguards, hitmen and terrorists. Silent 4mm. Resembling a tube 2 x ¼”, often non-metallic. Contains a 4mm bullet, captive piston and small propellant charge. A single-shot single-use silent firearm that can easily be concealed in many other objects. Has a subsonic velocity and produces no muzzle blast or flash. A suppressor is not required and will make no difference to performance. May have plastic ammunition, particularly if the tube is also made non-metallic. Can be built with tag or drugged ammunition if you know where to ask. Velocity too low for hollow-point or armour-piercing effects. Treat as a 4mmC pistol round with 10% of the range.